Is freedom to be feared? What a cruel irony it would be, if the centuries-long process of human emancipation – from tyranny, from god, even from privation – resulted not in our ultimate happiness but in our ultimate isolation. How would we cope? 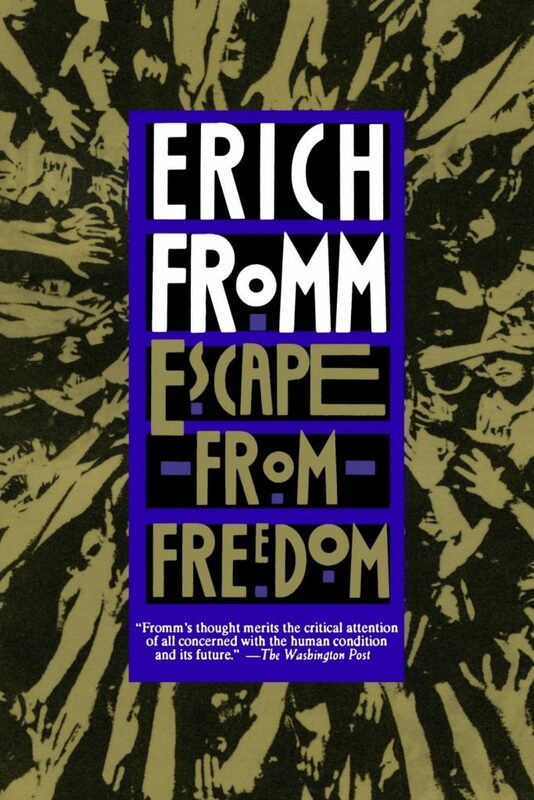 The thesis of German-American psychologist and philosopher Erich Fromm’s first and still most influential work, Escape From Freedom, is that the majority of us would sooner sacrifice our newfound freedom for the certainty, identity and purpose offered by an ideology. And, writing in the first half of the 20th century, Fromm had a terrifying example of such a totalizing ideology near at hand: National Socialism. Before he can make his case for the psychological appeal of Nazism, though, he must take us on a historical tour of the psyche, spanning several centuries, to demonstrate our growing freedom – and our uneasy reaction to it. Fromm points to two historical developments in particular that entailed massive psychological consequences for the individual: the erosion of the power of Catholicism, and the advent of market capitalism. Medieval man, ignorant of Copernicus and Galileo and Darwin, was assured of his place in the universe, and of god’s love for him. Prior to capitalism’s “creative destruction,” the economy of Europe was based on crafts, guilds, and agriculture. In having a distinct, unchangeable, and unquestionable place in the social world from the moment of birth, man was rooted in a structuralized whole, and thus life had a meaning which left no place, and no need, for doubt. A person was identical with his role in society; he was a peasant, an artisan, a knight, and not an individual who happened to have this or that occupation. The social order was conceived as a natural order, and being a definite part of it gave a feeling of security and belonging. The medieval social system was destroyed and with it the stability and relative security it had offered the individual. Now with the beginning of capitalism all classes of society started to move. There ceased to be a fixed place in the economic order which could be considered a natural, an unquestionable one. The individual was left alone; everything depended on his own effort, not on the security of his traditional status. Fromm is not arguing for the overthrow of capitalism, still less for socialist revolution; he is merely pointing out the psychological consequences of capitalism on medieval man. If capitalism also unleashed man’s creative energies as never before, creating wealth and prosperity beyond medieval man’s wildest imaginings, it also forever destroyed his sense of security in his own worth. In a capitalist society, value is determined by the market; what the market does not want does not have value. If there is no use for the qualities a person offers, he has none; just as an unsalable commodity is valueless though it might have its use value. Thus, the self-confidence, the “feeling of self,” is merely an indication of what others think of the person. It is not he who is convinced of his value regardless of popularity and his success on the market. If he is sought after, he is somebody; if he is not popular, he is simply nobody. All of this begs the question: what will man do with his newfound freedom, if the price he pays – security, identity and purpose – is so steep? The terrifying temptation, open to everyone, is to abdicate responsibility, disavow your freedom, and enlist your intellect and psyche in the service of something greater than yourself, something that offers its adherents moral certainty and purpose. By becoming part of a power which is felt as unshakably strong, eternal, and glamorous, one participates in its strength and glory. One surrenders one’s own self and renounces all strength and pride connected with it, one loses one’s integrity as an individual and surrenders freedom; but one gains a new security and a new pride in the participation in the power in which one submerges. Given this perspective, and the great instabilities inflicted on 20th century man, from the wars to the Great Depression and the hyperinflation that followed, it’s no great surprise that so many sought psychological refuge in ideologies. But what of 21st century man? Surveying the cultural landscape, in which even the most ancient categories of man and woman, husband and wife, are being called into question, I wonder if we will not see a resurgence of the 20th century’s ideological wars – fought, this time, within nations, rather than between them. And I wonder where modern man will find the strength to resist their lure and stand on his own.